divThe National Institute of Mental Health (NIMH) reports that in 2015 nearly 18 percent of adults in the United States suffered from some form of mental illness, often termed any mental illness, or AMI. Almost 10 million American adults, which is 4 percent of the population, battled serious mental illness (SMI) in 2015, NIMH further publishes. 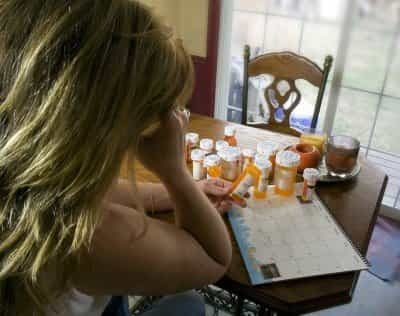 Often, medications are part of treatment for mental illness to stabilize brain chemistry and improve life functioning. Individuals struggling with mental illness may attempt to medicate symptoms on their own by taking mind-altering drugs or drinking alcohol. Drugs and alcohol can also interact with brain chemistry, serving to enhance pleasure and reduce stress and anxiety. For someone suffering from mental illness, drugs and alcohol may seem to help them “balance” difficult symptoms related to the disorder. This practice is called self-medicating, and while it may seem to work in the short-term, self-medication can lead to many risks and can even make mental illness worse in the long run. Substance abuse is extremely common among people who struggle with mental illness, as the U.S. Department of Health and Human Services (HHS) reports that as many as one out every four Americans who battle serious mental health concerns also has issues with substance abuse. People struggling with depression, anxiety disorders, personality disorders, and schizophrenia are the most likely to also have issues with substance abuse. Depression can induce overwhelming sadness, sleep issues, and trouble coping, which may be temporarily alleviated with drugs and/or alcohol. People who struggle with bipolar disorder, a mood disorder that involves significant mood swings from mania to depression, abuse alcohol and drugs at very high rates as well. Psychiatric Times reports that around half of those battling bipolar disorder will struggle with issues involving alcohol abuse. Anxiety disorders, like social anxiety disorder, may make it hard for people to function normally in everyday life, and drugs and alcohol can temporarily blunt anxiety and make social interaction easier as they lower inhibitions. Alcohol and drugs may also commonly be used to self-medicate the difficult recurring symptoms of post-traumatic stress disorder, another anxiety disorder. Symptoms of personality disorders, such as borderline personality disorder (BPD), can make it difficult for a person to carry out everyday tasks, making drugs seem like a happy diversion. Schizophrenia is a serious mental illness, and individuals suffering from the disorder regularly turn to drugs and alcohol as a method of tempering psychotic symptoms. Alcohol: Interacting with brain chemistry to lower anxiety, increase happiness, decrease inhibitions, and heighten sociability, alcohol is a common substance used to alleviate stress and symptoms of mental illness. Alcohol is a depressant, and it slows functions of the central nervous system, helping to promote relaxation and calmness. Alcohol can therefore temporarily relieve tension and enhance mellow feelings. Stimulants like cocaine and methamphetamine: Stimulant drugs greatly enhance pleasure by causing a spike of dopamine in the brain. Dopamine is one of the brain’s neurotransmitters that sends signals telling a person to be happy. Stimulants can also increase energy, focus, and attention, and help a person to stay awake for long periods of time while suppressing appetite. Opioids like heroin and prescription painkillers: These substances elevate happiness and mellow feelings while also acting as central nervous system depressants and blunting anxiety and stress, reducing tension, and increasing relaxation and sedation. Marijuana: Commonly used to help people “chill,” marijuana has both hallucinogenic and depressant effects, altering perceptions and enhancing relaxation. Marijuana may alter moods and help people to sleep. Depressant drugs, including tranquilizers and sedatives: Often prescribed to treat mental illness, these prescription drugs can also be abused when used without a legitimate prescription. They help to reduce anxiety and depressed moods while enhancing sleep functions and stabilizing brain chemistry. Medications are often highly beneficial in treating symptoms of mental illness, but only when used as directed under the supervision of a medical or mental health provider. Prescription medications are often an important aspect of a complete treatment plan. When mental illness goes undiagnosed, or symptoms are not being properly managed, it may encourage a person to attempt to medicate these troubling symptoms on their own, however. Self-medication can be highly dangerous. Drugs and alcohol can have unpredictable side effects and can interfere with any medications a person may already be taking, making them less effective or even having more serious consequences, such as a potential toxic reaction leading to a life-threatening overdose. Drug and alcohol abuse can also increase the intensity and possible side effects associated with the mental illness, leading to more issues and possible problems. Mood swings can be more significant, and psychotic symptoms may be more likely as well when abusing substances. While under the influence of drugs or alcohol, a person may take bigger risks and get involved in situations that can be potentially hazardous, which can also be compounded by the fact that many mental illnesses also include impulsivity and a lack of regard for consequences as side effects. Accidents, injuries, unwanted pregnancy, criminal behaviors, and increased odds for contracting a sexually transmitted or infectious disease are all possible consequences of self-medicating mental illness. The “crash” that can follow the “high” produced by substance abuse can also be compounded when a mental illness is also present. Depression and anxiety can then worsen. The Office of National Drug Control Policy publishes that teenagers who are depressed are twice as likely to abuse illicit drugs, including marijuana, than adolescents who are not depressed. Marijuana use can greatly increase suicidal thoughts as well as raise the odds for engaging in other risky behaviors like additional drug abuse, heavy alcohol consumption, or daily cigarette smoking. Withdrawal side effects of alcohol and drugs can make a person more likely to continue abusing substances to avoid these negative side effects, which are only exacerbated if a person also battles mental illness, Psych Central warns. Substance abuse in the presence of a mental illness increases the risk for developing drug dependence and suffering from addiction. The journal Addiction Science & Clinical Practice reports that mental illness and addiction are complexly intertwined; each condition makes the other worse and may lead to the onset of one or the other. According to the 2014 National Survey on Drug Use and Health (NSDUH), over 21 million American adults struggled with addiction involving drugs and/or alcohol. Nearly 8 million adults in the United States battled both addiction and mental illness at the same time in 2014, the Substance Abuse and Mental Health Services Administration (SAMHSA) reports. When both mental illness and addiction are diagnosed in the same person at the same time, the disorders are said to be co-occurring, and specialized treatment is optimal for recovery. Half of those who battle SMI and one-third of the individuals struggling with AMI also abuse substances, the National Alliance on Mental Illness (NAMI) publishes. Substance abuse may provide a temporary balance, or reprieve, to mental illness symptoms; however, in reality, self-medication only serves to make things worse. Brain chemistry is altered by drugs and alcohol, and similar brain regions may also be related to the onset of mental illness. Substance abuse only increases the potential imbalance, making symptoms worse, and making it difficult for treatment methods to work as intended. Depression, anxiety, sleep issues, appetite alterations, irritability, restlessness, trouble thinking clearly, suicidal ideations, psychosis, and mood swings are common side effects of addiction, all of which may also be symptoms of mental illness. Drug dependence is a side effect of addiction, and withdrawal symptoms that occur after drugs process out of the body can be significant. These withdrawal symptoms are even more intense and pronounced when a co-occurring mental illness is also present. Withdrawal can be particularly intense then for someone battling mental illness, and professional help is often needed to help the drugs safely process out of the body. A medical detox program can help to manage cravings and withdrawal symptoms while minimizing relapse. Medications are often an important aspect of medical detox, and in the case of co-occurring disorders, all medical and mental health providers need to work together to ensure that the necessary pharmacological tools are complementary. Medical detox is the safest way to help someone struggling with co-occurring disorders to stop taking drugs. Detox is generally the first step in a comprehensive treatment program, providing a safe and secure environment in which to achieve physical stability. The National Institute on Drug Abuse (NIDA) publishes that a comprehensive and integrated approach is optimal to treat co-occurring disorders. This simultaneous method of treatment ensures that all members of the treatment team work together toward the same goals. Since each disorder can influence the severity and side effects of the other, they are treated at the same time. Thorough assessments and drug screenings are important before admission into a program and then throughout the treatment program to evaluate progress. Behavioral therapies, including Cognitive Behavioral Therapy (CBT), teach healthy coping mechanisms for managing stress, anxiety, and difficult emotions. In group and individual therapy and counseling sessions, clients learn new life skills and habits for managing co-occurring disorders. Family counseling and therapy serve to educate loved ones and help in improving communication skills and the inner workings of the overall family unit. Specialized support groups also aid in providing positive social interaction, helping to dispel isolation that may be related to one or both disorders, and providing tips and tools for minimizing relapse. Generally, residential treatment programs offer the highest standard of care, providing around-the-clock care and supervision in a structured and stable environment. Individuals may be moved between levels of care as they progress in treatment. Balanced nutrition, set sleep schedules, medication management, traditional therapeutic care, and holistic techniques can all be beneficial components of an integrated treatment program for co-occurring disorders.